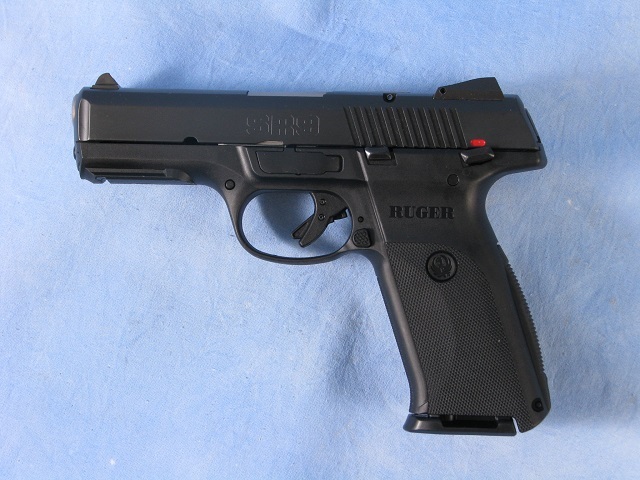 Ruger SR9 9mm Luger 4.14 Inch Barrel Nitridox Pro Black Finish Adjustable Sights 10 Round. Reliable, striker-fired ignition. Semi-Double Action trigger pull - 6.5 pounds. Short trigger reach. Reversible backstrap (flat or arched). Slim ergonomic grip features a 17-degree grip angle and three, 22 lpi checkered panels. Camblock helps absorb recoil. High-visibility 3-dot sight system is click adjustable for elevation and drift adjustable for windage. Picatinny rail. Ambidextrous manual safety and magazine release. Visual and tactile loaded chamber indicator. Includes hard case, extra magazine, magazine loader, padlock, and instruction manual.